Naima Benwakrim is the Director of Human Rights and Monitoring at the National Council on Human Rights of Morocco and is a member of the Central Authority for the Prevention of Corruption. 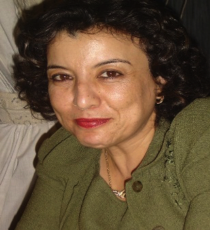 She has previously worked in the Equity and Reconciliation Commission (Morocco’s Truth Commission), monitoring activities related to: public hearings, the Commission’s final report, and its objective of mainstreaming a gender-centric approach. 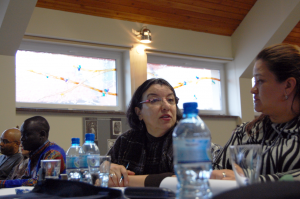 She also worked for two years as a local consultant for the International Center for Transitional Justice. Adopting provisions to effectively sanction serious violations of human rights with adequate penalties. Establishing an apparatus to provide for penal and disciplinary measures with the goal of punishing the behaviors and practices that lead to impunity with regard to serious violations of human rights. Publicly condemning acts of genocide and violations of human rights. The establishment of plans and policies to fight against discrimination that may lead to grave violations of human rights, to cases of impunity with regard to these acts, and to the repetition of them. I think, in the Moroccan context, human rights workers think that the issue of genocide prevention is not a priority for Morocco, given that the country hasn’t known war or internal armed conflicts. Thus, the advice that I give to my colleagues, since my return from the Raphael Lemkin Seminar, is that the Moroccan context displays all of the ingredients that can cause these atrocities and that it’s imperative to include prevention in our actions that promote a culture of human rights. For you personally, what was the most important element of your visit to Auschwitz ? For me, as a specialist in transitional justice and someone who is very conscious of the importance of the preservation of memory for the prevention of all serious violations of human rights, I honestly appreciated it all and cannot bring myself to specify which element was the most important. I was fascinated by all of the effort that has been made to preserve the memory of the atrocities that took place in the two concentration camps. It was an effort that put me in the context and permitted me to fully grasp the extent of the atrocities produced in these camps. It must serve to further mobilize us so that it is never reproduced again. In my opinion, Auschwitz-Birkeanu is among the greatest successes in the world in the preservation of memory. Who or what inspires or motivates you to continue your work ? My ambition to protect peace, tolerance, respect, and the diversity and fraternity in my country and around the world.